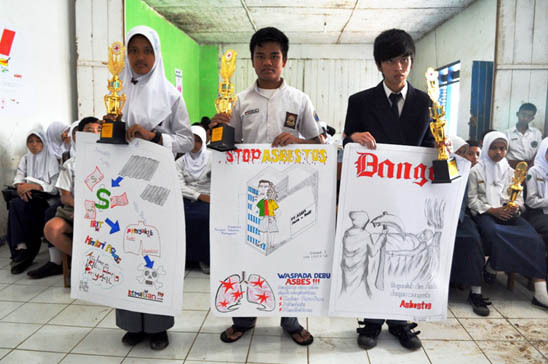 On July 21, 2011 months of preparation, consultation and discussion culminated when 25 groups of participants from 15 schools in Bandung Raya took part in an Asbestos Danger Media Competition which was held on the campus of a senior high school in West Bandung. This drawing contest was organized by Ina-Ban and the Indonesian Red Cross-West Bandung. At the beginning of the day's activities, the contestants, who had previously been informed about asbestos through class discussions, receipt of flyers and via social media sites, took part in an information session during which they confirmed the presence of asbestos in their daily life  as roofing material or well coverings. At the end of the discussions, the entrants were given drawing materials and five hours to make a poster with an asbestos theme. 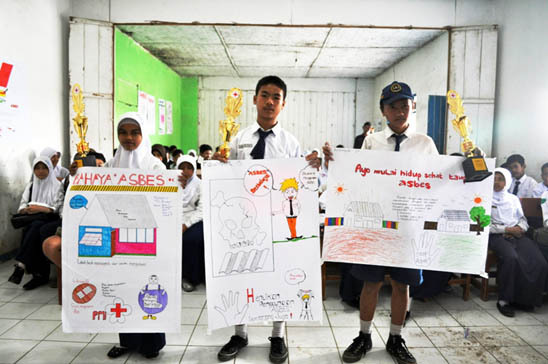 At the end of the allotted time, the posters were displayed and judged by representatives from the school, Ina-Ban and the Indonesian Red Cross; prizes were awarded to the winning teams. Follow-up activities will include the printing and distribution to the schools of the posters as well as debriefing sessions with participants and sponsoring groups. Throughout the Summer (2011) another competition is taking place aimed at older students and members of the public. As with the competition discussed above, the Asbestos Photographic Competition is being conducted in stages dedicated to: raising awareness of the asbestos danger, exploring measures to minimize hazards and producing photographic images to educate the public. 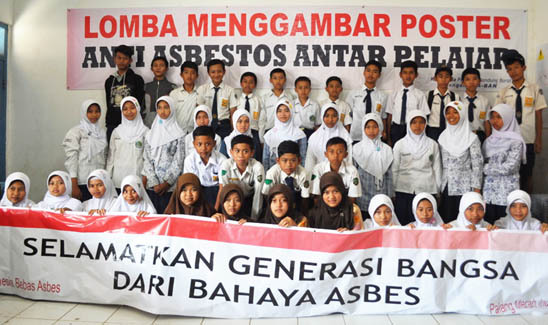 On September 18, 2011 the winner will be announced at a ceremony to be held at the end of an asbestos seminar in Bandung. News of this competition is now being disseminated via the web, facebook, flyers and posters, and potential entrants are registering their interest in taking part. Ina-Ban continues to work with social partners to ensure that asbestos is a topic addressed at meetings being held to progress public and occupational health issues. 1 Members of Ina-Ban include health and safety activists, environmental campaigners, trade unionists and representatives from non-governmental organizations such as Local Initiatives on OSH Network, Indonesian Forum for the Environment (WALHI), the Federation of Construction, Informal and General Workers Union (FKUI-SBSI), the Sedane Information Institute, the MOTHER Foundation and Habitat for Humanity, Indonesia. 2 Kazan-Allen L. Raising Asbestos Awareness in Indonesia. April 19, 2011. Kazan-Allen L. Asbestos Action in Indonesia. October 27, 2010.